The Marine Corps may be in the process of drawing down from 202,100 Marines to 182,100, but there are still plenty of opportunities for personnel to cash in if they’re willing to take on the right job. 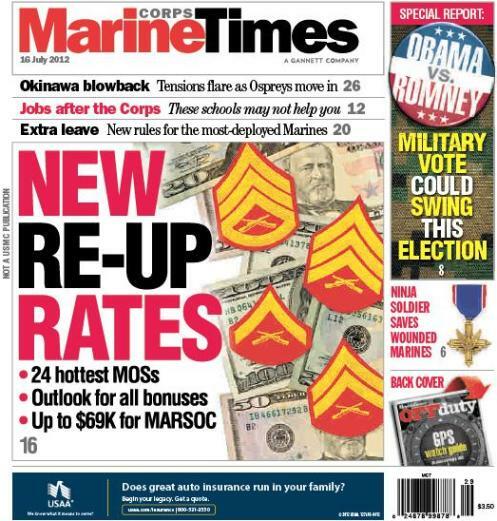 That immediately becomes obvious when examining the Corps’ 2013 Selective Reenlistment Bonus plan, which is the subject of this week’s Marine Corps Times cover story. First-term Marines are eligible to receive up to $69,750, and 18 military occupational specialties actually will see larger bonuses in 2013 than they did in 2012. With assistance from Manpower and Reserve Affairs out of Quantico, Va., we lay out the options Marines have this year. The total pot of money available shrunk $108 million last year to $85.7 million, but there are a number of bright spots for those willing to make a lateral move into an in-demand job field. This week’s paper also includes a special report examing how the military community could swing the U.S. presidential election this fall. To check it out, pick up a copy on newsstands now or subscribe online here.